Handsome blogger Thomas of The Sunday Best has proposed to his gorgeous GF Sharon … and yes, she accepted! 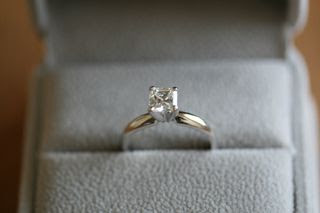 I’m excited to have created the Asscher-cut engagement ring for the lovely couple. This is the first engagement ring I’ve done for a blogger. How sweet! Lucky her, that’s a man with taste! This is perfect, and just set off the bells & whistles in my head! I've told my mother for years that the star sapphire cabachon she has would be my "if ever" engagement ring… but finding a great setting would be impossible. So at this point, if you are still a designer when & if I am ever proposed to, I want YOU to design that ring & give the stone the justice it deserves. lovely ring! i love asscher cuts…so classy. congrats to the happy couple! Oh wow, congratulations to Thomas and Sharon! The ring is beautiful. Oh I love it. I’m a sucker for happy endings and what not. so beautiful!! 🙂 how great to be a part of their union! you need to have links to ALL your engagement rings, I wanna see ALL! OMG Wendy. This ring is amazing!! AWWW!! Yep, this whole story–proposal, song, proposal acceptance, gorgeous WendyB ring–deserves a CAPITAL AWWWWWW!! Congrats to them…but really WendyB! I love this ring. And I don’t have anybody giving me an engagement ring, but I am tempted to buy it for myself! LOVE IT! Gorgeous ring. I’ve always loved an Ascher cut! beautiful ring! and what a cute proposal! she looks SO HAPPY! A beautiful ring for a beautiful couple! Classic, beautiful ring.. Best wishes to the couple! What a lovely, beautiful ring! Congrats to Thomas and Sharon. How romantic! And what a beautiful ring WEndyB designed. I love this story. YAY!!! Congrats to TSB. this is so awesome! beaut ring. I’ve been giving my boyfriend serious hints like, “When are you going to get me a ring and propose and when are we going to get married and do you want to get married in a church or somewhere else and should i wear a white dress?” I don’t think I could be any more blatant. I think a sapphire ring would be fitting! WHAT A STORY! Bloggers helping out bloggers! Everythings connected now!